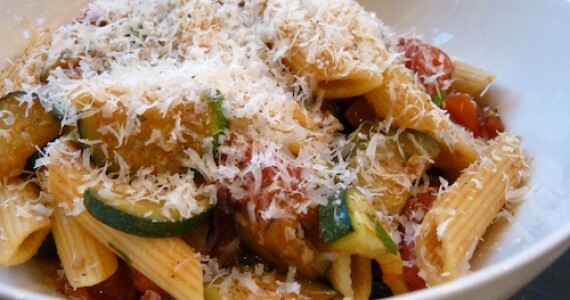 A rustic tomato and zucchini pasta dish that is tasty and filling. Sweat the onions in the hot olive oil until translucent with salt and pepper. In a separate pan cook the pasta while you prepare the sauce. Then add the zucchini and the garlic until slightly golden. Add the tin of tomatoes and red wine vinegar and cook through. Add the basil, salt and pepper to taste. Drain the pasta when cooked and add to the sauce. Heat through and eat.